For basic anatomy it is a great source for basic anatomy. I still use my thieme and other atlas’s for charts, finer detail, and diagrams. This atlas would plenty suffice for any review, but as an osteopathic student with higher goals, I wish there were expansions on the kinetic chains, the fasciae layers and connections, more muscle subdivisions (especially for the trapezius), neuroanatomy (which feels like it could use some help), and different posturing. The current setup does display the individual components really well at the sacrifice of the interconnections and unity of the anatomic system. Extra selection/exclusion criteria would be cool. It would be nice to single out the anatomy that may be localized to the tributaries and targets of a single nerve/spinal segment/lymph node region etc or to toggle by function (extensors/flexors, etc). The lack of specificity in this along with the lack of position changes makes the app feel stale. The search option is an amazing tool though the process can feel like a time sink if you have more than 3 items to select for. Aside from this the app feels very easy to use, and is a great resource that I highly recommend. I would really appreciate the addition of counterstrain and trigger points for individual muscles along with the chapman points in their periosteal/fascial homes, but I understand this is a real niche for bodyworkers. First, I would like to preface this review by saying I LOVE this app. I have used it for 5 years now throughout my undergrad and now in grad school. In undergrad, I primarily used the Mac version of the app with absolutely zero complaints. 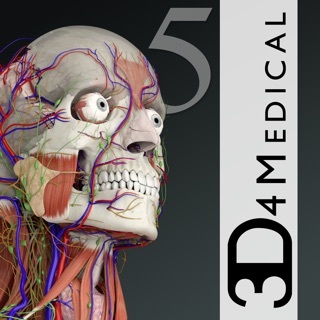 Beautifully designed, great interface, really helpful, organized information and a cool interactive way to learn anatomy. Overall, great app. However, my one major flaw with the iPad version of the app corresponds with its ability to not recognize the Apple Pencil with certain functions. For example, when selecting a muscle, it works perfectly fine. But, when I try to use the Apple Pencil to tap something like “isolate” or “hide” or “fade” or whatever, it simply does not work. This is extremely frustrating, having to switch between using my fingers and using the pencil. It seems like a flaw or an oversight or something, and I would greatly appreciate amending this issue. After that, the iPad version of this app is easily 5 stars. I have had this app for about 2 and 1/2 years now: If you are an undergraduate student in health/exercise science programs, this app will be your best buddy. It will allow you to really understand everything you are learning and it’s location/orientation within the body. This app comes with so much information and really gets you the most out of the money, even if you don’t find yourself using all of it. The basic functioning is great and really smooth. However, once you begin upper level classes this app will not be what you are looking for. You will need to buy an atlas for access to material that this app does not include. All in all, you should buy this if you are an undergraduate student learning introductory anatomy, kinesiology, etc. You should not buy this app for advanced anatomy, radio graphic/ sectional anatomy, or most other upper level anatomies.